So, I have this plant in my studio, on a shelf above my desk. One of the few house plants I keep these days, because, as you can see, I am not good with house plants. Which is a bit funny because I have a huge garden, and two green thumbs when it comes to everything I plant outside, but when it comes to indoor plants, I am the worst. But this plant, this peace lily, I’ve had for 20-some-odd years. And yes, it’s still this small because I’ve almost killed it so many times that it has never grown any larger. I only ever remember to water it when I look up (which obviously isn’t very often) and see it drooping the way it is in this photo. At one point, a few years back, it only had two leaves, and I was literally on my way to the garbage can with it, but then, I stopped. This plant is tough. A fighter. And we’ve been together a long time. So I re-potted it, vowed to take better care of it, (snort) and gave it another chance. Because, hey, it’s given me more chances than I deserve. We’ve never given up on each other. 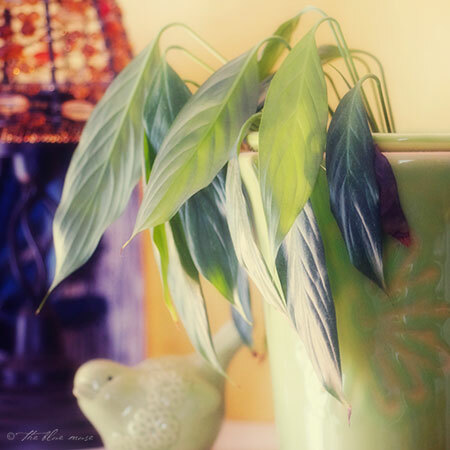 Peace lilies are said to be the indicator when other house plants need water. I have one that was given as a gift and I almost lost it too…now it is blooming again. I have some success with house plants but I seldom give them the care I give my outside garden. I think I need to give them a bit more love soon. We have a day lily that we bought in remembrance of our rabbit Liliana Lu, and it’s a remarkably resilient plant too. Our cats would eat it if it were a house plant, so we keep it outside and then move it into the garage every autumn when the frost comes. Inevitably, we forget that it’s in the garage when spring rolls around, but somehow even without the sunlight (a previous tenant blacked out the garage’s windows), that lily comes out of hibernation on its own every year, sending up green shoots that we discover a month after the weather turns warm. And every year, its blooms increase.